At Ceres Organics we like to keep things simple and clean. Our tiger nuts are just that! Contrary to the name, tiger nuts are not actually a nut but rather, a small root vegetable. Our African Paleo ancestors relied heavily on this super-root for nourishment. Full of plant-based goodness, this unique product contains 33% dietary fibre, but the real stand-out is its resistant starch content – a dietary fibre recognised as an important prebiotic. 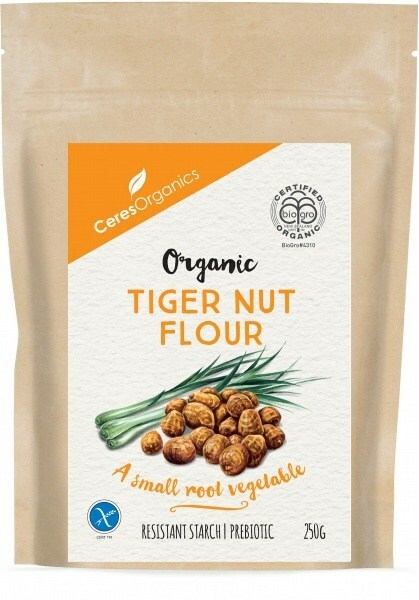 With its unique sweet-nutty flavour, Tiger Nut Flour is super versatile and works great in both savoury and sweet recipes. Ideal for creating nutritious and delicious gluten, nut and grain free food, or as a smoothie booster.